All safety precautions taken were discussed, before installation, with University of Glasgow Health and Safety authorized personnel. It was chosen to install the robot in a room of its own and its control unit in a adjacent room, to be out with the reach of the robot. The rooms have been especially adapted for this purpose and are restricted access area since taking in operation of the robot. After receiving permission from the University Health and Safety fire expert the second entrances to both rooms have been closed off. Access to the rooms can now only be gained via the security video surveyed lab. The locks to the rooms were changed and a small number of keys were cut and hand out to a selection of staff (the list of key holders is kept by trained health and safety personnel). Campus Security and janitorial team have been instructed not to provide access to anybody before consulting with a member of the research team or the in the building stationed School of Computing science technician’s team; Except the event of an emergency such as flooding of the rooms or smoke formation. Cleaning personnel has not access to the rooms. Safety zone marker-stripes, the safety zone cannot be reached by the robot. 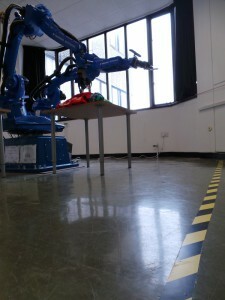 Before the robot could be installed, both rooms had to be refurbished to fit the future purpose. In this process the rooms where inspected by a structural engineer on their capacity to carry the weight of the equipment. A, by the structural engineer specifically designed, floor reinforcement was put in place. 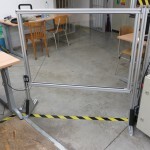 This floor reinforcement is preventing structural damage from operating the robot and fulfills the necessary safety requirements for the immobilization of the robot base itself. The control unit in is located at the very end of the control room, as far away from the entrance door then physically possible. This is to ensure that it represents no hazard in case of an emergency evacuation. The control unit powers the robot, for which it has its own three-phase main power socket. The power socket is equipped with a switch to cut the power directly at source, in case needed. 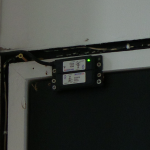 The three-phase main supply has been installed by an official subcontractor of the University specifically for the control-unit; no other equipment is supplied by this socket. The wall between the robot room and its control room has been altered. It has been widely replaced by large size control-room windows. These are not made out of glass but contain 1cm thick clear see-through Perspex. The thickness of the Perspex is assessed as sufficient to keep accidentally flying objects, such us the button of a shirt, of perforating the Perspex. All structural alteration measures of the refurbishment were preceded by an asbestos survey of the concerned areas of the building. Where asbestos was found the necessary safety precautions were taken and where needed removed by a licensed company. 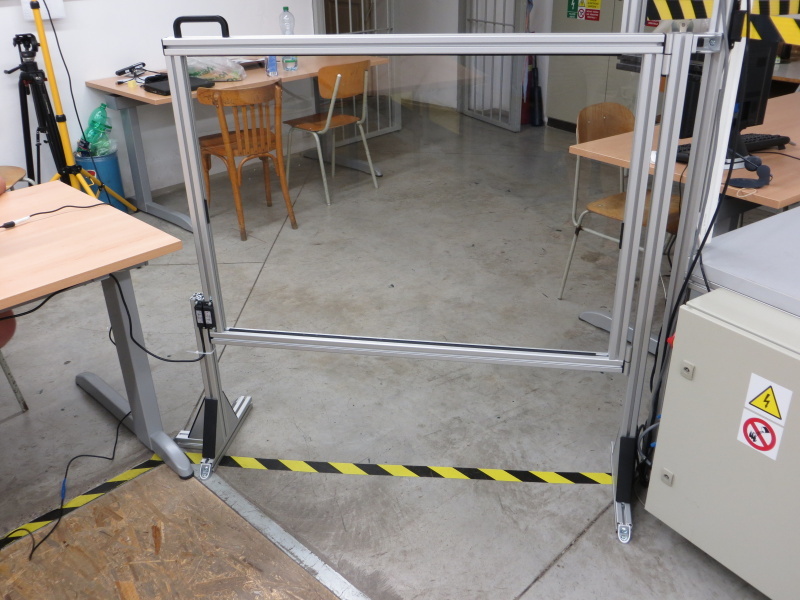 Door interrupt – if the door is opened the robot stops. 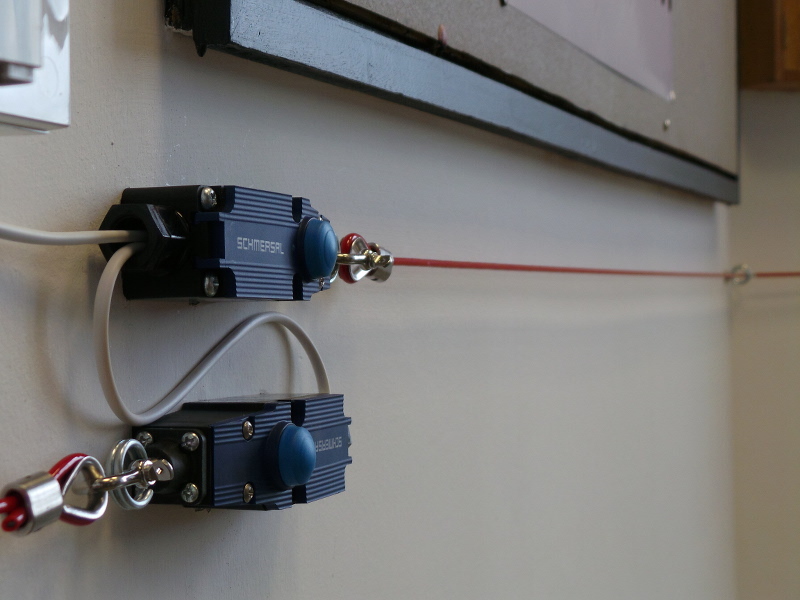 In order to insure the safety of students and staff around and while operating the robot a variety of safety equipment has been installed in the control room and robot rooms. The robot’s control unit is equipped of a touch pendant with an emergency stop button. Pushing this stop button interrupts and prohibits immediately all activities of the robot, independently of what state the robot is in. It can only be released physically on the touch pendant. A further emergency stop button, Telemecanique XALK174F, is installed in with the operators reach, right above the operating bench. It is fixed onto the window frame and can therefore not be moved around as in the case of the touch pendant. Furthermore it is directly wired into the control unit and is therefore independent of the touch pendant functioning. It can only be released physically by the operator. Both buttons enable the operator to interrupt the robot in case of emergency or malfunctioning. The robot room door has been equipped of a safety interrupt door switch. This switch is also directly wired into the control unit. When the door is being opened the control unit interrupts immediately all movement of the robot. The interrupt can only be reset manually on the touch pendant in the control room or by rebooting the control unit but only if the door of the robot room has been closed. This switch ensures, if the operator would forget to lock the door to the robot room, to prevent anybody of entering the room with the robot operating. 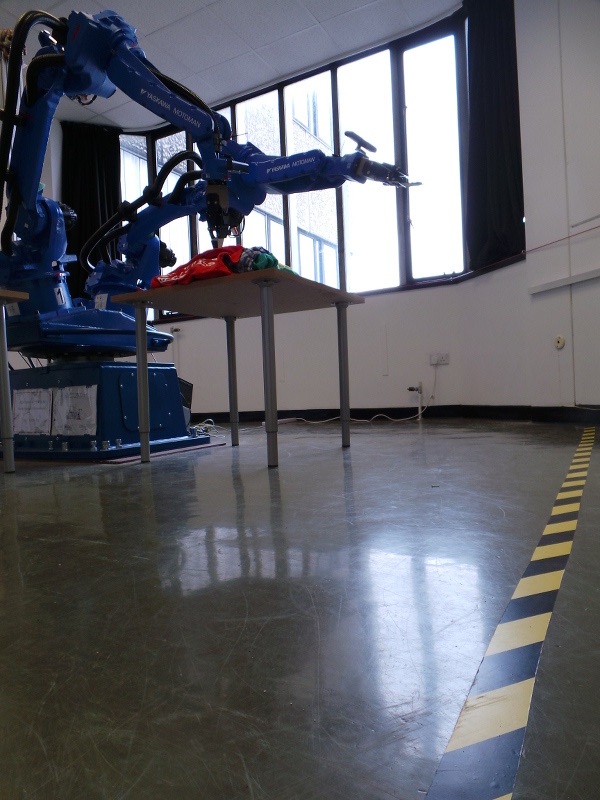 In the exceptional/accidental situation that someone would be present in the robot room, when the robot starts to operate, the floor is labelled with safety zone stripes on either side of the room. These areas are out with the possible reach of the robot. Hence, when standing outside the robot area, behind the stripes the robot’s arm can no longer come in touch with a person. 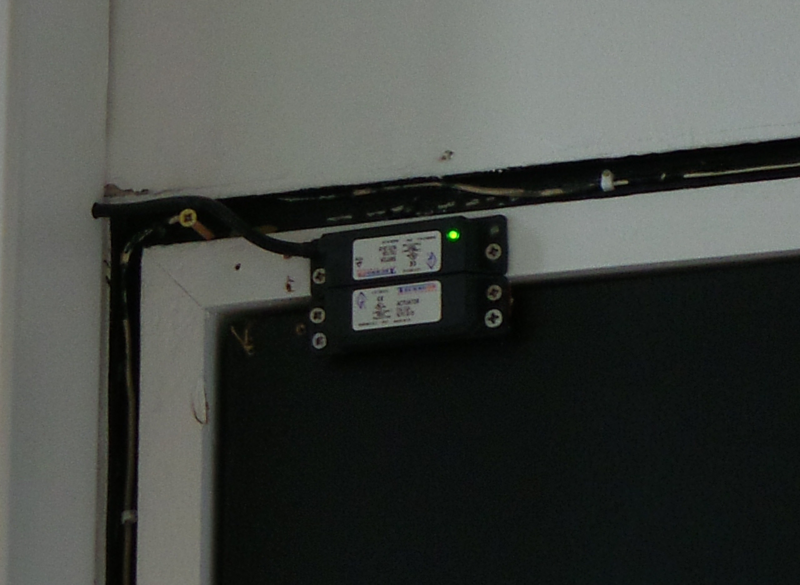 Around the room, starting at the entrance door and stopping behind the door, is span a grab-wire interrupt, Schmersal ZQ 700-02. 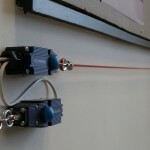 This grab-wire can be pulled from anywhere in the room, interrupting and preventing immediately the robot of operating. As for the other safety equipment the grab-wire interrupt has been directly wired into the control unit and most be physically reset. All of the safety equipment has been purchased from official suppliers of the University of Glasgow and have been installed by health and safety trained staff member.